Host response against bacteria or their toxins eventually play a major role in alveolar bone destruction observed in periodontitis. Because of the role in bone resorption, bisphosphonates were applied as adjunct to non-surgical therapy. This review highlights the effects of bisphosphonates on clinical parameters as adjunct to periodontal treatment. Significant clinical and radiographic effects were observed in animal and human study models. 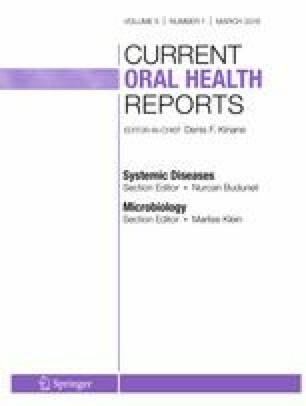 In recent studies, local usage of the bisphosphonate gels was examined in periodontitis patients to prevent the systemic side effects. The mean pocket depth reduction, clinical attachment level gain, and the percentage of defect depth reduction were greater in bisphosphonate group. Bisphosphonates appear to be effective in improving clinical outcomes of periodontal treatment. However, the clinical relevance still remains controversial because of the differences in methodology in the studies. New evidences from high-quality clinical trials are required to clear the clinical application of bisphosphonates as adjunct to non-surgical periodontal treatment in periodontitis. Hillner BE, Ingle JN, Berenson JR, Janjan NA, Albain KS, Lipton A, et al. American Society of Clinical Oncology guideline on the role of bisphosphonates in breast cancer. American Society of Clinical Oncology Bisphosphonates Expert Panel. J Clin Oncol. 2000;18(6):1378–91. https://doi.org/10.1200/JCO.2000.18.6.1378. Pradeep AR, Kanoriya D, Singhal S, et al. Comparative evaluation of subgingivally delivered 1% alendronate versus 1.2% atorvastatin gel in treatment of chronic periodontitis: a randomized placebo-controlled clinical trial. J Investig Clin Dent. 2017;8(3):e12215. https://doi.org/10.1111/jicd.12215.